All posts by Timo H.
I'm a geographer specialized in urban and regional planning issues, but above all, I’m interested in cities, Europe and the world. Cities have always been where it all happens. Culture, science, innovation, politics – you name it. I am not really interested in the technical details of constructing urban environments but instead in embracing them as cultural products. I enjoy exploring cities, understanding their history and contemporary circumstances as well as envisioning where they are on course for. The great thing about cities is that they are always changing and so complex in nature that you can’t ever understand them holistically. There’s an ongoing need for some more exploration. Finland’s revolutionary aim to curb car ownership with driverless cars and MaaS mustn’t evolve into an excuse for not making better cities. Finland and especially Helsinki have lately received a fair share of global media attention thanks to ambitious plans for bettering urban life by making car ownership obsolete in the next decade. Or “to fill in those gaps in door-to-door mobility which lead us to choose our cars“, like Anne Berner, Finland’s Minister of Transport and Communications recently summarized the aim. The number one avenue for making this vision real is revolutionizing the transportation system through welcoming digitalization and new technology. Going high-tech and getting serious with intelligent mobility. The timing is certainly ideal. The nation’s youth seem more interested in smartphone ownership than car ownership – or even getting a license in the first place. Furthermore, servicization has changed the way we do business and the more recent phenomenon known as the “sharing economy” is altering the value of ownership. Not to mention that open data platforms are popping up everywhere to fuel the smart city progression. To get on the intelligent mobility bandwagon, the focus within Finland’s transportation policy circles seems to be buzzing around two main pillars. 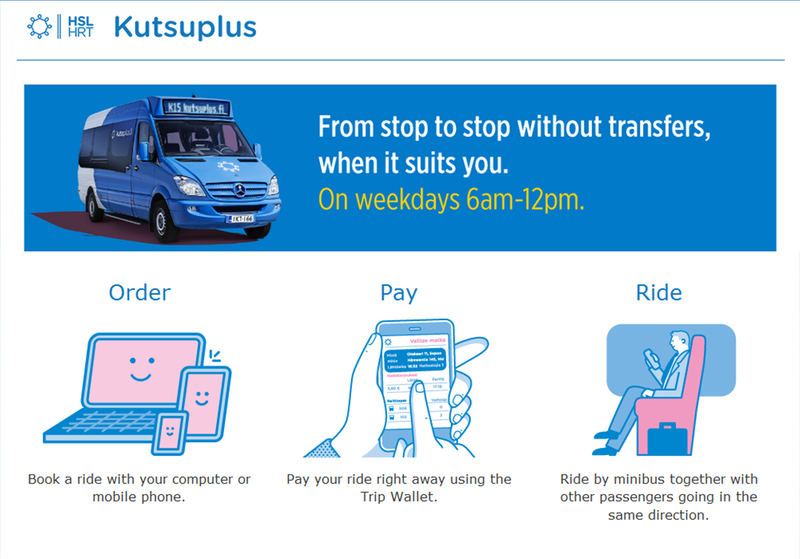 Helsinki’s Kutsuplus service is an on-demand minibus. A bit like a public taxi. It’s one of the first experiments in Finland that tries to make transportation more connected to your smartphone. Image: HRT. First, there’s an idea to transform the way we consume transportation services called Mobility as a Service (MaaS). It was introduced to the wider public in 2014 by Sonja Heikkilä as a new model how Helsinki could upgrade its transportation system. The idea has quickly diffused to other cities around the country, too. And this summer, Finland’s new central government is already thinking about how the state could help with advancing MaaS. The main idea behind MaaS is to introduce one stop shops for transportation services. For customers, a single interface (an app or website) would thus serve as both travel planner and payment platform, integrating for example the use of public transportation, city bikes, shared rides, rental cars, and long-distance trains to one seamless mobility chain. Moving around could be sold based on usage or in bundles, much like the services on your mobile phone plan. Even delivery services could be included so you wouldn’t need to travel to get something if you didn’t feel like it. 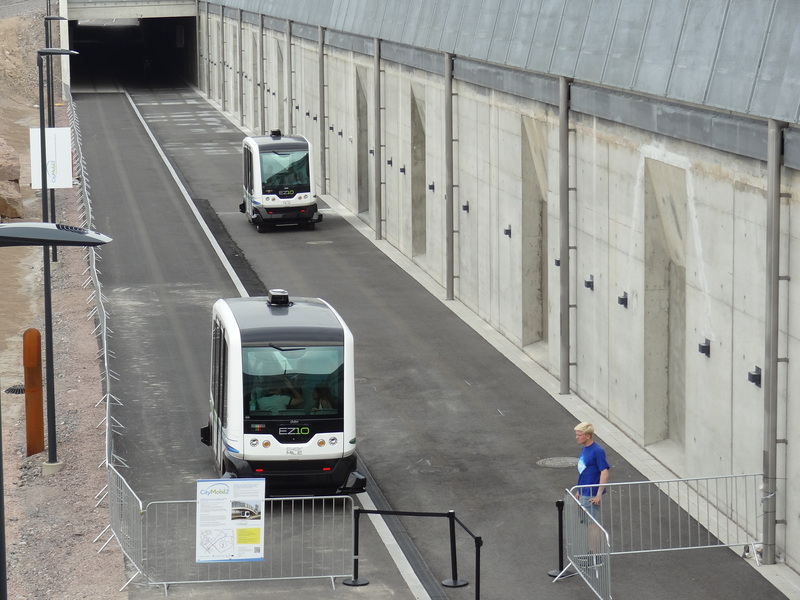 Autonomous vehicles were experimented in Vantaa this summer as part of the CityMobil2 project. I got to take a ride too. The setting in this photo displays one problem we may have with driverless cars in the future: we’ll want to keep them separated from people. A parallel, but profoundly connected, idea to MaaS is the adoption of autonomous vehicles. In terms of urban transportation, driverless cars are specifically envisioned to be the primary provider of shared rides in the future. These may either come in the form of on-demand public transportation services, such as Helsinki’s already-operating Kutsuplus mini-bus service, or smaller private vehicles like taxis and/or via Uber-like services. Or all of them. The vision for going “car-free” is based on assumptions that ride-sharing and car sharing could take cars of the streets. And driverless cars could amplify this with their promise of super efficiency. Now our non-autonomous cars are idle for 96% of their time. According to OECD estimates, a scenario like this could result in a 90% reduction in the number of cars on the street. This would leave 80% of the parking space we now need obsolete. An added benefit is that autonomous vehicles are also predicted to decrease the amount of accidents. There would be less human involvement messing things up. This is how cars spend 96% of their day. The benefits of Finland’s digitalization plans stretch beyond the issue of car ownership. For people, it could offer seamless multimodal trip-making, better way-finding, and thanks to increased competition between transportation service providers, personalized and more user-friendly services. ICT companies are looking at opportunities to make big bucks. The value of the Finnish transportation sector is estimated at about 50 billion euros. Digital services have largely yet to enter this market. So figuring out a successful business model can take you to the stars. For the public sector, new business of course means more resources. But intelligent mobility could also cut costs with more efficient infrastructure usage and better system management. This would enable allocating resources for services that need most support. The cherry on top of the intelligent mobility vision is the urbanist’s daydream. A city with fewer cars and less traffic opens up avenues for giving more space to people as e.g. valuable urban space needn’t be turned into parking lots anymore. The transportation people certainly have ambitious plans and with good goals. Digitalization and new technology are definitely one side of going car-free. But just one. There’s a low-tech side, too. This summer I toured the Philippines and got to experience the streets of Manila. The megacity infamous for its traffic problems. The Lonely Planet puts it well when they warn that “traffic is the big annoyance in Manila: you’ll probably spend half your time either stuck in it or talking about it”. Traffic gets bad in Manila. And it’s at times very difficult to get across these monster streets. It’s very hard to walk to many places, because there are cars everywhere. But it’s equally hard to get anywhere by car because there are cars everywhere. If traffic would get any worse, the city would just be one massive outdoor car park. Undeniably, Manila is a prime example of how a city gets completely choked if there is no efficient and comprehensive mass transportation for everyone. Asking around, the traffic problems also very much irritate locals. Especially the dreadful commutes that mean early mornings, late evenings and a lot of time wasted sitting in vehicles of different sorts. However, at a canyoning adventure in Cebu, I ran into one exception. A woman from Manila told me she is happily free from much of these commuting worries because she has the luxury of being able to walk to work. A privilege she wouldn’t give up for the world. Indeed, as it was for her, for many people walking is the most convenient form of transportation. Walking is the oldest and most natural way for humans to move around. All you really need is shoes. There is no need to find parking, no schedule to figure out, and no tickets to buy. Walking is true freedom. 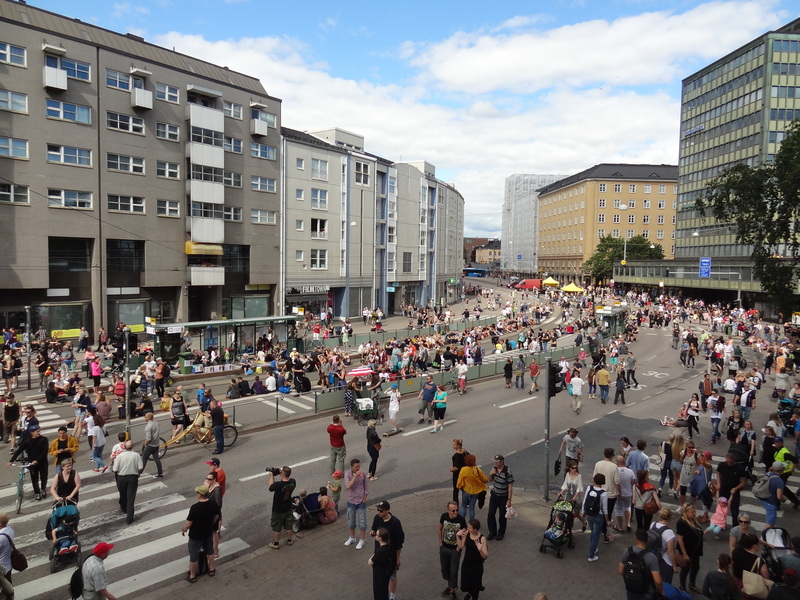 This summer Kallio Block Party transformed closed down the streets close to where I live. This kind of Tactical Urbanism is a good way to remind people how space could also be used if it wasn’t just in the use of cars all the time. Just like apps and self-driving cars, also “walkability” is creating excitement as an idea to curb driving. The walkable city is a strategy where the work of land-use planners, urban designers and transportation planners are integrated to create dense, mixed-use development patterns. For many, car ownership becomes pointless because everything you need is within easy reach. The benefits of prioritizing walking, cycling and transit over driving are essentially the same as in the intelligent mobility visions: moving more people using less money and less space. With walkable cities, emphasis is not in the digital but the physical. And that’s a whole art of its own. 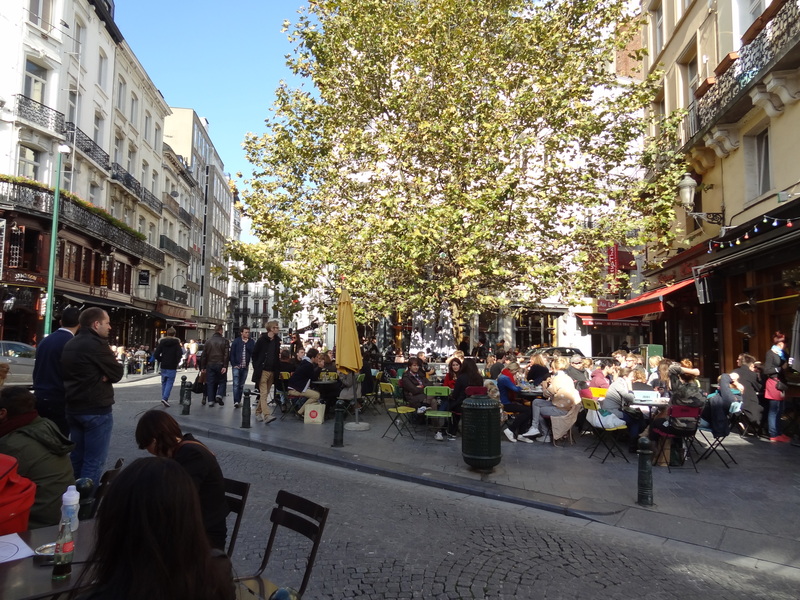 Because cities are complex, there however is no single blueprint for creating walkable places. Multiple aspects contribute to a great walking experience. In his “General Theory of Walkability”, Jeff Speck tries to crystallize what it’s all about by summing up that walkers are attracted by places which provide a walk that is simultaneously useful, safe, comfortable, and interesting. Each of these qualities is essential and none alone is sufficient. 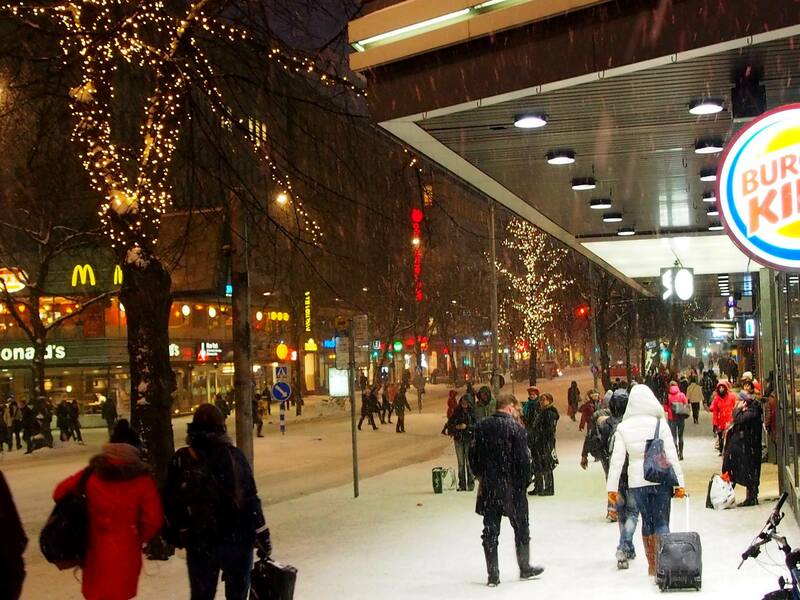 The walkable city concept is also catching on in Finland. Helsinki for one has ambitious goals in the air for making it possible to reach destinations with just your feet. In its new draft city plan, Helsinki views for expanding the inner city and retrofitting a number of cars-only highways to walkable boulevards. Helsinki dreams about transforming a bunch of highways into boulevards in the future. If all goes well, they should definitely enhance walkability. Image: City of Helsinki. 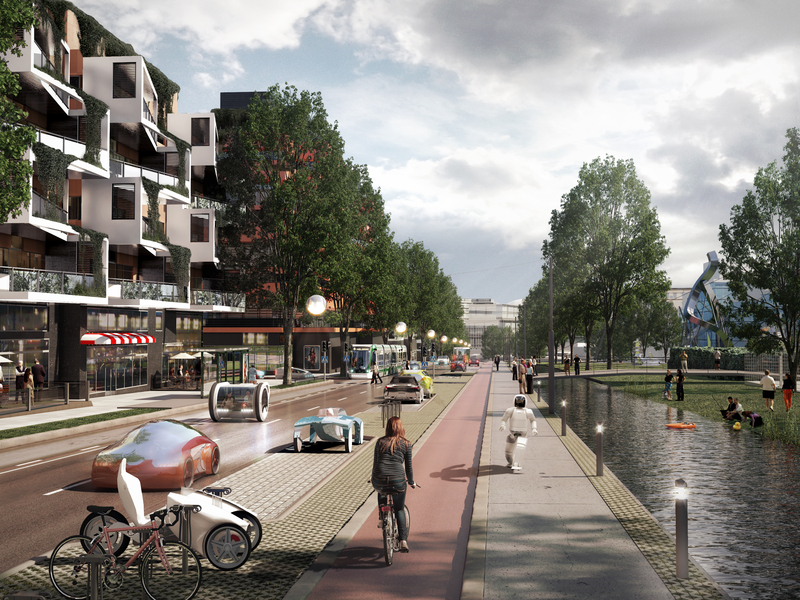 So all in all, looks like all is well and Finland’s urban landscape has cozy, car-ownership free cities on the horizon. Right? How high is walking on the intelligent mobility agenda? And there’s work to be done on that side of the field. The truth is that thanks to a long era of making life easy for the automobile, only a tiny fraction of our urban areas constitute as walkable places. And similarly, our planning culture has a lot of catching up to do when it comes to progressing walkable cities – especially for those parties in the planning sphere who deal with mobility. Just a couple of weeks before taking off for the Philippines I took part in a workshop set up by urban planning activists to generate ideas for designing downtown Helsinki to become more attractive. Even if Helsinki is no Manila, the number one issue that was discussed was the need to prioritize pedestrians over cars. 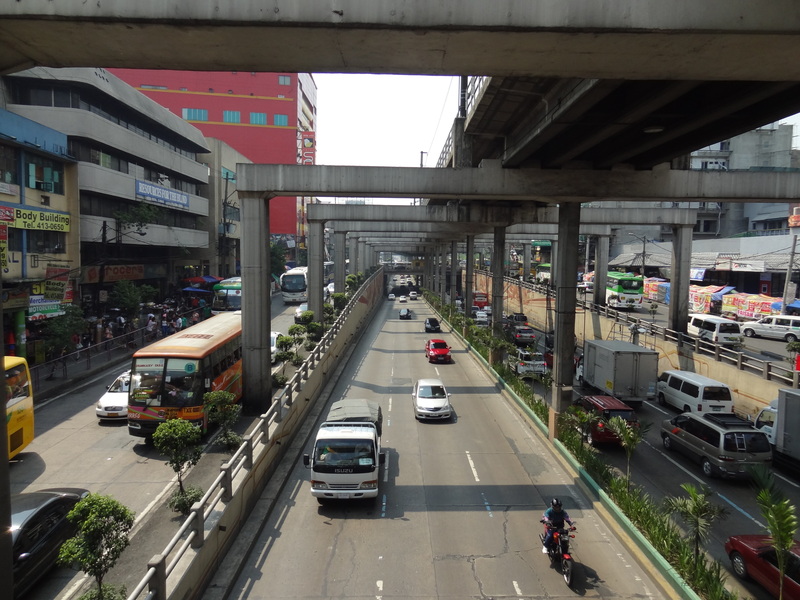 Many deemed the pedestrian experience unpleasant due to noise resulting from unnecessary through traffic in several places around the center, poor pedestrian access, surface parking lots, and generally, the excess space allocated just for cars. In her new PhD thesis, Anna Broberg’s research concluded that the areas around Jumbo shopping mall in Vantaa were the least walkable. The image tells more than a thousand words. Image courtesy of Google Maps. Helsinki’s most recent report analyzing the development of traffic in the city paints a good picture of how close those working with transportation are to the idea of progressing walkable cities: it mentions pedestrians once. There are 52 pages. Cycling gets awarded four pages and the rest is centered around motorized traffic. Measure what you treasure, the saying goes. And it certainly doesn’t get any better when you climb up the ladder of transport modes. There’s only one modern-ish bike share system in Finland. The Tampere City Bike system was installed in 2013. Yes, that’s right. Just one emerging system. 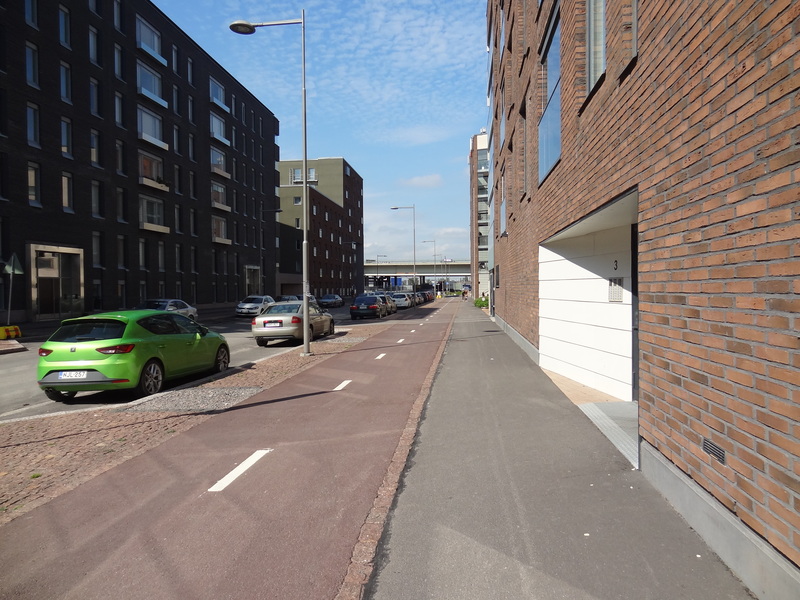 This street in Helsinki’s Kalasatama was supposed to have separated one-way bike lanes on each side of the street. The kind all cyclists pressure the city of Helsinki to build. The plans were approved and all, but what materialized was one two-way bike line that cuts the sidewalk into half. This was in 2013. I wonder what would happen if we just decided not to build a couple of lanes on a highway? Cycling advocates around the country have tirelessly tried to fight against traffic engineers for decent bike lanes and paths. This is especially a problem in denser urban contexts where the conventional suburban style of excessively separating vehicular traffic and walking/cycling to their own roadways can’t be done due to space constraints. To my experience, despite the pretty outspoken goals of freeing us from the nuisances of needing to own cars, much of the tech visioning within the transportation circles is way too disinterested about integrating the enormous amount of work that still needs to be done with the physical realities of our cities to their future scenarios. Apps are not going to help you ride a bike to the nearest transit stop if the physical infrastructure doesn’t exist. This also casts a shadow over the walkable city ambitions. We know from the auto-era that transportation policy-makers need to be on board if we are to encourage inwards-directed urban growth. Otherwise things can go very wrong. Before moving on, I first must stress that to some extent this whole discussion on technology revolutionizing the transportation sector in the ways described, is theoretical. Who would have guessed we now have smartphones but still don’t have electric cars even though the technology was invented in the 19th century? In the same way, we don’t know what will happen with e.g. the driverless car. But it is nonetheless fun to speculate. And anyways, official policies are already made based on assumptions that all this new transportation-related technology will be ubiquitous sooner than we know it. So we also better be proactive with designing control measures to keep things going so that everyone wins. 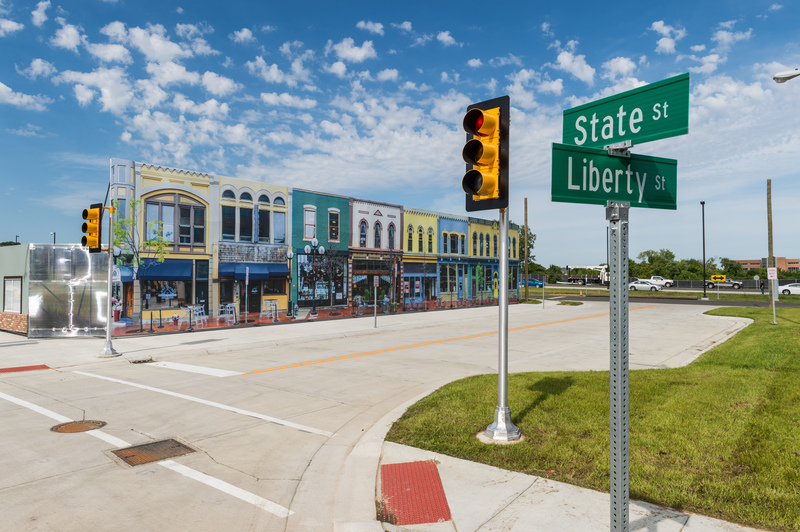 This is a ghost town, built just for testing driverless cars. Image courtesy of the University of Michigan. So, back to my story. What should we be doing then? A huge obstacle for creating cities where you don’t need to own a car is a bunch of norms and regulations that make the creation of walkable cities impossible. At the moment it would be illegal to build anything comparable to Helsinki’s most walkable neighborhoods. The national and local regulatory frameworks have been summoned by well-meaning authorities from various departments to solve singular problems in their line of work. But when these regulations are put together, they effectively block all attempts for applying time-tested urbanism. The kind that will attract people to walk. Cars once took us to our destinations much faster and conveniently, but we took it too far (just ask the folk in Manila) and are now trying to get rid of them. With the advent of autonomous vehicles and more efficient vehicle-based mobility in general, we need to be careful that we’re not repeating the same mistakes again. We know from experience that more asphalt leads to more cars and traffic. While we’re trying to make today’s traffic flows more efficient by having commuters share rides, there’s a chance we may be making room for other kinds of traffic. Moreover, with driverless cars also those who don’t have a license could theoretically become “drivers”. And as a safety measure, authorities may be inclined to segregate pedestrians and cyclists from the robocars to keep their flow undisturbed. 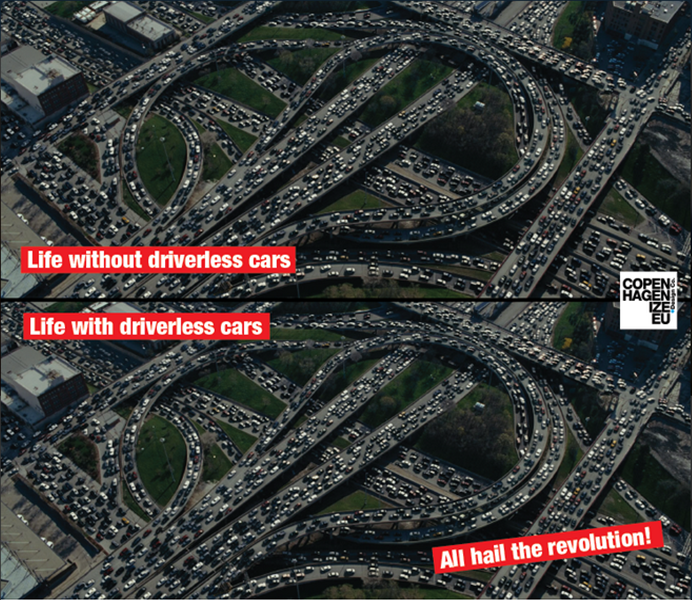 Things may go wrong with driverless cars.Image by Copenhagenize. We know how this ends. Soon we’ll be demanding for new roads and real-estate developers will start taking advantage of easily accessible cheap land. This will all encourage further dispersal and, ultimately, we’ll have even less reasons to walk. Getting rid of car ownership through digitalization and technology is not enough on its own. We need to couple the vision with a strategy to stop building new road capacity and gradually plan for road diets where it makes sense. Besides just making cities denser, we also need to streamline our institutional approach to driving. Key is to incentivize transportation modes based on their cost and space efficiency. Right now there is institutional support for driving in the form of tax breaks, allocation of infrastructure investments and so on. At the same time, driving is causing environmental damage and has negative health impacts. Altogether, driving appears much cheaper than it is. This needs to be reversed. And while on the topic of public transportation, we should also think where it makes sense to use on-demand public transportation. Here in Helsinki, Kutsuplus is now for the most part servicing the densest and most walkable corners of the city. But only a few use it. This is not because people aren’t fond of the concept. I find that most people don’t use it simply because they don’t need it. I for one never do. All my destinations are within easy reach by either walking or scheduled mass transit. Both options are more convenient than using Kutsuplus. A point-to-point service is inconvenient especially if you want to get a coffee on the way or just experience the city. So maybe we ought to be figuring out what are the geographical areas where the concept is most useful. Sometimes going from A to B can get distracted by something on the way. I wonder how they try to anticipate this in all those traffic models? The more we have walkable cities, the more complex our mobility becomes. For years, there has been a lot of talk about intensifying already built-up areas all around Finnish cities. But in large scale this has never happened and most new construction is still further dispersal to greenfield sites. The promise of fewer cars will however open new avenues and needs for making it happen. There are at least three transportation-related things we could do. First, since we don’t need to build new roads, cities can let go of old road infrastructure reservations. Every larger city has a road project or two that are freezing attempts for adding density. Second, we can reduce surface parking. We should start with places that either have most potential for infill purposes or for increasing high-quality open space in the city. One of Helsinki’s top tourist attractions, the South Harbor area and Market Square are now partially in very smart use. And third, we should uncouple parking from building. 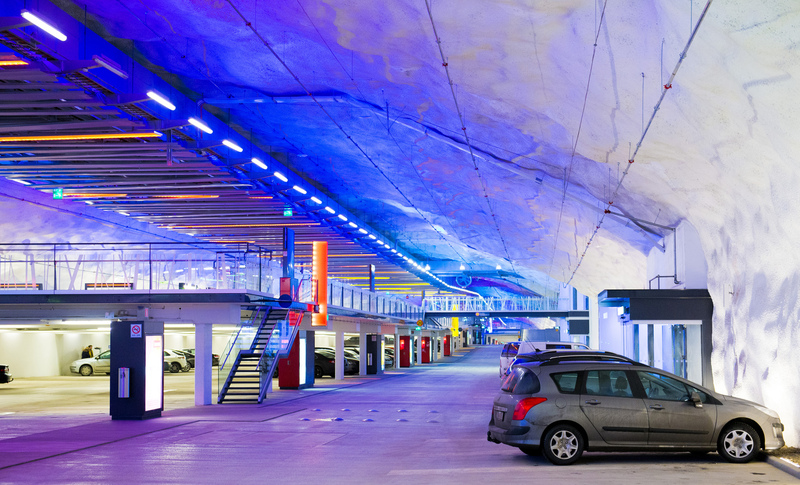 Underground parking can cost as much 50 000€ per parking spot in an underground garage. Overall, the math is simple. Building dense is just not possible, because the more you build, the more parking spaces you need to build. And that gets expensive for everyone. Except superficially to those who drive. E-commerce is on a path towards creating unnecessary traffic, pollution and nuisance. If we were to have further automation in the delivery process and will continue to have free return policies, the parcel business could boost traffic flows considerably as stuff would move in and out of homes favoring online shopping much more often. We need to invent and pilot smart models for accommodating this in the walkable city. Maybe bike or other low impact kind of messengers? And of course there’s PiggyBaggy, the Uber of deliveries to help. Whatever it may be, if the digital vision does in fact create less need for parking facilities, emptying underground parking garages in city centers could connect to the world of delivery traffic. This is part incentivizing, but I wanted to give bikes their own point. Because the issue is simple: there is no way out of pulling the brakes on discouraging cycling. If the bicycle is an integral part of multimodal traveling, we need to make them happen. This means bike share systems, building cycling-friendly urban infrastructure; including making all transit stations bike-interchange friendly. Bike parking in the Netherlands. Image: Lost in the Urban Jungle blog. This list could probably go on endlessly, but my point is that the well-known wisdom of the trade is that land-use planning and transportation planning are not different things, but the essence of city planning. If we want seamless mobility and livable car-free cities on the horizon, we need to be making sure there’s enough brainpower, energy and resources being invested in both the low-tech and high-tech dimensions of those places. That means progressing world-class pedestrian, cycling and transit conditions – not just new apps and driverless vehicles. I don’t want to see MaaS, driverless cars or any other intelligent mobility vision evolve into another excuse for not making better cities. This spring, Finland’s second city Tampere has been the scene of an interesting urban planning spectacle. Or probably ‘drama’ is a better word to describe the turmoil around the city’s ambition to move on to the second phase of its experiment for temporarily transforming Tampere’s main street, Hämeenkatu, into a transit-only zone. The first phase was initiated last summer by cutting off the street’s eastern half from private cars. Access was left to buses, taxis, and logistics vehicles. The rationale behind the entire experiment is to prepare Tampere for the introduction of a new tram system in 2018 or 2019. Its arrival would make the transformation permanent. 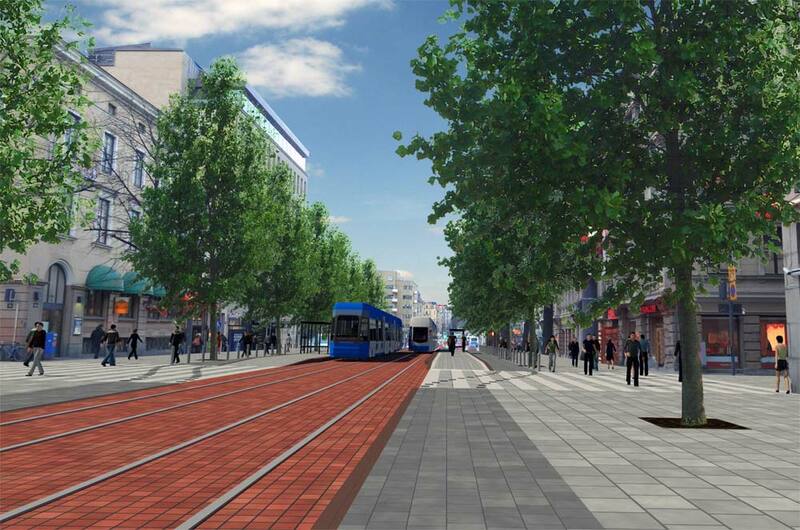 A visualization of how Hämeenkatu could transform once the tramway gets built. Image courtesy of the City of Tampere. 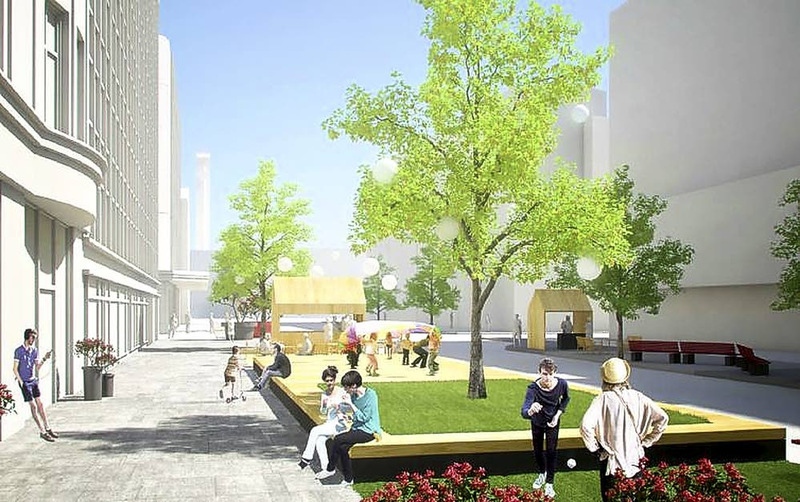 The goal of the second phase is to slim down the now unnecessarily large space for vehicular traffic and to widen the sidewalk to add more people-space such as parklets, event stages, and room for terraces. Generally, the point is to set the scene for how the street could be like if the tram gets built. The budget for all of this is not high, only 70 000€. The second phase of Hämeenkatu’s experiment is set to bring more people-space. Image courtesy of the City of Tampere/Aihio Arkkitehdit. I’ve been very excited about this project because it represents exactly the kind of stuff Finnish cities should be doing today. But what happened next was a bit unexpected. When the second phase of the experiment came in front of the Planning Committee for approval, they voted against it. This was preceded by an uprising against the entire Hämeenkatu experiment, mainly generated by a group of business owners outside of the project area as well as a demographic who are difficult to budge from behind their steering wheels. The main arguments against the experiment are that it has and will continue to make Tampere’s city center less attractive because limited access for cars leads to congestion and less parking spaces. Even despite the fact that just in 2012 a new 972-lot underground parking garage was opened directly underneath Hämeenkatu. 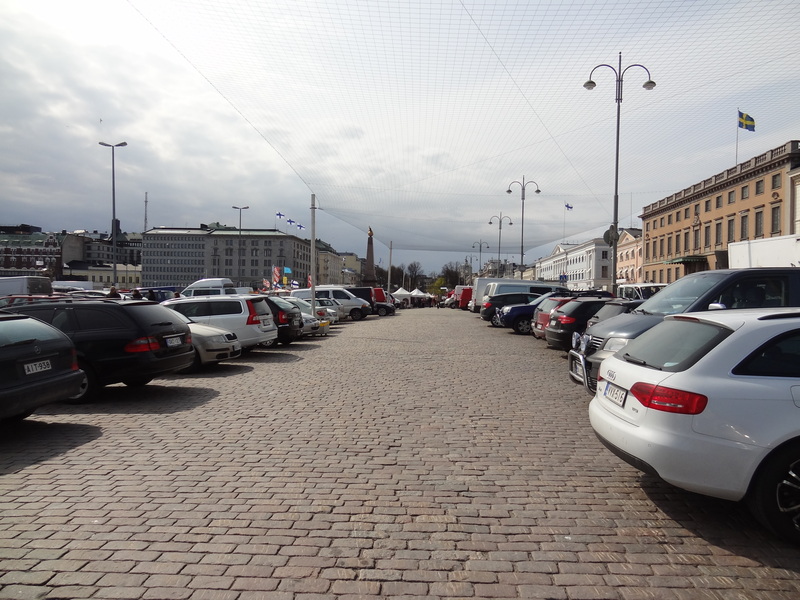 There’s more parking space in the center of Tampere today than ever. P-Hämppi directly beneath Hämeenkatu offers 972 spots. And elevator access directly to shops and the street. Photo courtesy of Aihio Arkkitehdit. And it’s not just the loss of car access that’s believed to push customers away. Also the idea of giving more space to people has been viewed as a dangerous avenue towards actually inviting more people to use the street. According to critics, this is likely to result in increased malicious behavior and thus is a public safety concern. The recipe for prosperity would be to stop with the nonsense and put cars back on the street. Wow. As incredible as some of these arguments may seem, the sentiments flared up and began to amplify through social and conventional media outlets. Eventually they swam into the political decision-making process. But the attack against the experiment doesn’t necessarily mirror the current state of the main street. Tampere’s main street Hämeenkatu and a wintry atmosphere. Doesn’t look so dead or dangerous, does it? Photo credit: Erkki Ottela. To my experience Hämeenkatu has never been nicer and always when I’m in Tampere it’s full of people. I’ve never heard anyone not go there – or into the center more broadly – because of the transit street experiment. Furthermore, an interesting fact underlying this debate is that research suggests that business owners in city centers often know little about their clientele’s travel behavior. When tested about the degree that entrepreneurs in Tampere and Turku knew how their customers travel to the center and their establishment, they got it all wrong. It was strongly believed that an overwhelming majority (ca. 2/3 or more) of customers arrived by car compared to the segment that came with public transport, bicycle or by walking. But when researched, the numbers were pretty much the other way around. Nonetheless, it wasn’t far that the entire experiment went to waste. Luckily Tampere’s Mayor Anna-Kaisa Ikonen stepped in and showed her leadership skills. She interfered and took the plan to be reviewed by the City Board. This time it got approved and this summer Tampere will be able to enjoy an even better Hämeenkatu. Or fundamentally, at least we’ll be able to tell whether this is all nonsense or progress after all. The good thing is that the experiment is low-cost and easily reversible if it turns out to be a death spell for the attractiveness of Tampere’s city center. This disagreement about whether to build Tampere for cars and traffic or for people and places could actually have taken place in just about any Finnish city council. It captures the spirit and problems of contemporary urban planning and policy. The big picture is that our cities are undergoing a huge shift from outwards sprawling growth patterns towards welcoming inwards-oriented growth. This is greatly thanks to a new generation entering the housing and job markets, the changing nature of work as well as the pressing environmental and economic consequences of suburban sprawl. Like Tampere’s efforts to introduce a tram system and Hämeenkatu’s experiment shows, cities have slowly began to react to the changing circumstances and are aligning their strategies to serve new sets of citizen-needs. Needless to say, I find this fantastic. But like Tampere’s example also shows, my concerns lie in the practical dimension. Putting those forward-thinking ideas in plans and getting on-the-ground results is no bootleg maneuver. Far from it. Big ships turn slowly, the saying goes. The truth is that there is a hefty generation divide in how the younger end of the age pyramid perceives urban life compared to the groups towards the top of the pyramid. Also, the modernist planning system doesn’t easily deliver anymore. Maybe it does for out-of-town greenfield projects, but definitely not when the focus is on intensifying the existing urban fabric. Endless bureaucracy featuring numerous evaluations, shallow public participation processes, and, significantly, the firm idea of planning until every last detail is fixed, all sum to lengthy, expensive and stalling planning projects. Things may be slowly progressing in the right direction, but for a long time it’s simply not easy to build the necessary political, financial, and/or civic support to push forward projects that aim for long-term change and transformation. But what if we didn’t just put our hope in the big stuff, but started to challenge the status quo with the small and simple? Conveniently, the Hämeenkatu episode coincided with my discovery of Mike Lydon’s and Anthony Garcia’s Tactical Urbanism: Short-term Action for Long-term Change, a great book focusing on how little, low-cost, often immediate, and temporary interventions can help plant the seeds for those big 21st-century-urbanism ideas to dodge the opposition, and eventually materialize as permanent change. It’s an approach for citizens, city governments and as well as for example developers or non-profits to “hack the city” and “disturb the order of things in the interest of change”. Intersection repair is one form of Tactical Urbanism. The goal is to slow down traffic and upgrade public space. Image credit: Greg Raisman. Lydon and Garcia link Tactical Urbanism with the above-mentioned contemporary circumstances that affect urban development, but additionally also to the rapid rise of the internet, social media, and, above all, the growth of a DIY culture among younger citizens. Indeed, the concept of Tactical Urbanism is inseparably married to the phenomenon of a rising number of self-confident young adults who are keen on taking part in planning processes as co-producers, not just as distant participants. That said, Lydon and Garcia also underline that Tactical Urbanism is not synonymous with all dimensions of DIY Urbanism that take place in cities (like e.g. pop-up street art). The common umbrella for Tactical Urbanism initiatives is that they are powered by “a movement based on a positive vision for the future”. 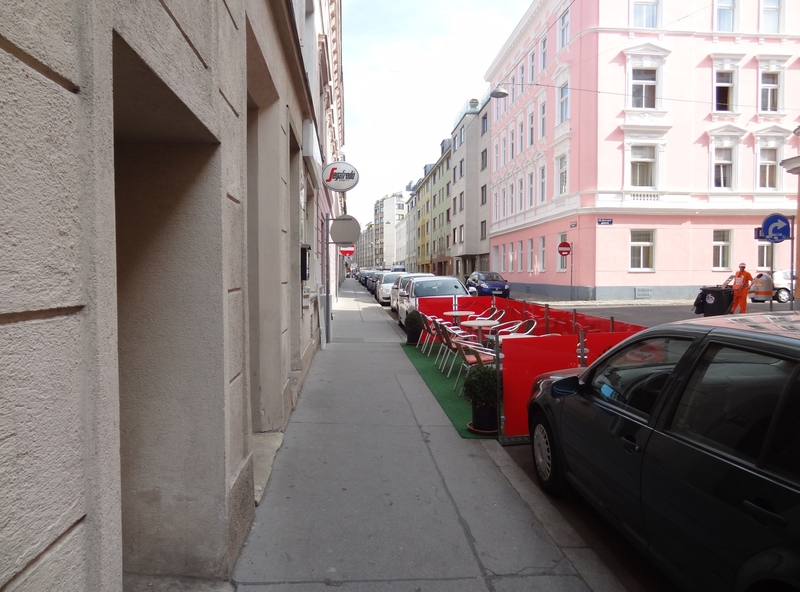 I ran into several applications of the parklet concept in Vienna. San Francisco born parklets are a popular form of Tactical Urbanism to make streets more livable. The idea has spread around the world. I don’t know the exact story behind Vienna’s parklets. 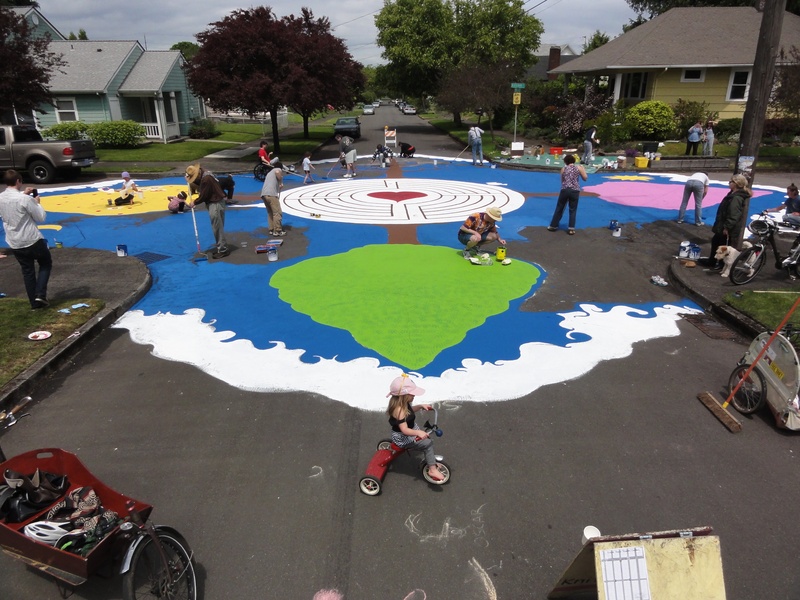 For citizens this means that Tactical Urbanism is a way to inspire their local governments to embrace change; to underline and call out for updating outdated policies that serve another era or to show what is possible using different methods. Cities on the other hand can use Tactical Urbanism within their planning processes to reach out to and inspire their citizens. This means using temporary pilot projects to bring planning concepts for people to touch and experience physically. Process-wise, a key idea is not to just make use of acting small, but also applying the open-ended philosophy “build-measure-learn” instead of the current top-down planning philosophy “design-present-defend”. For cities this means that long-term city development should begin to think about co-creation, fast prototyping and testing out new methods boldly. 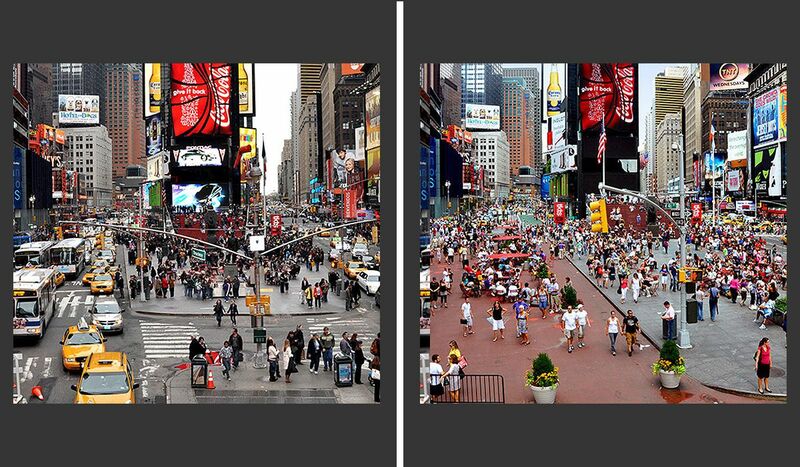 Times Square before and after its “pavement to plazas” transformation. Image courtesy of NYCDOT/Earthpowernews. A very well-known example of a city-led Tactical Urbanism intervention is New York’s Times Square transformation from car-friendly to people-friendly. After increasing pressure for giving more space to people in the traffic-congested square and debates over whether closing streets in the area would lead to gridlock in the city and cause people to go elsewhere, the city’s administration decided to try what would happen if they did remove cars from the area. Overnight, much of Times Square was cut off from cars and filled with cheap foldable chairs. The result? People loved it. And by collecting data through the different phases of the project, the city learned that the restructuring led to less congestion, shorter travel times, less accidents, more pedestrians, and eventually upped Times Square into the top 10 of world’s most valuable retail destinations. And perhaps most importantly, as everyone was able to see and experience the results for themselves, support to make the temporary intervention permanent came on its own accord. Rotterdam’s Luchtsingel footbridge. The structure is not just a bridge but a tool for making the area nicer and more attractive for investors. A cool example of bottom-up Tactical Urbanism comes from the Netherlands where Rotterdam‘s new Luchtsingel bridge got built using crowdfunding. 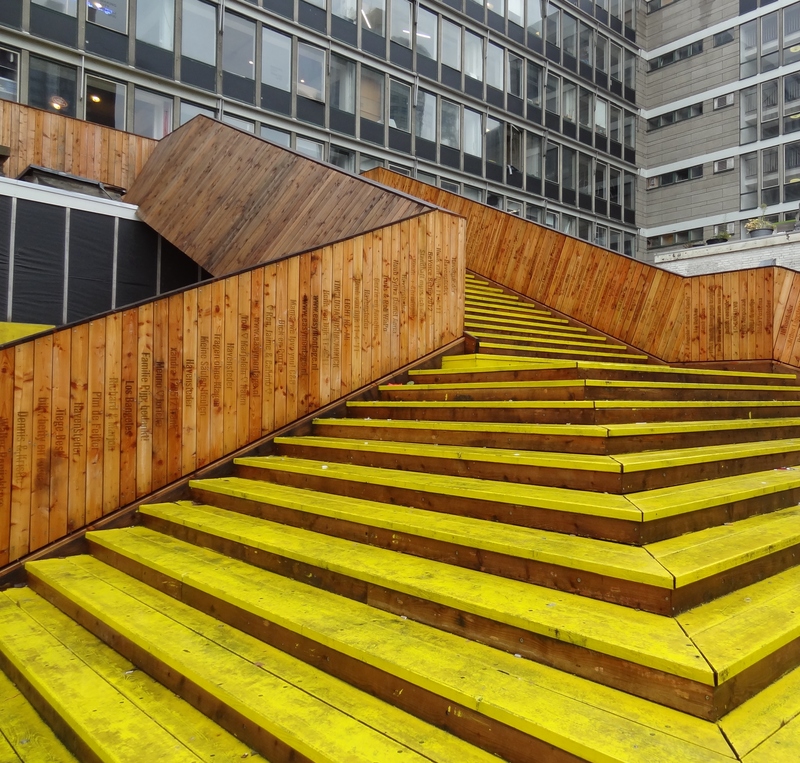 Following Rotterdam’s city hall not being able to improve the walkability of a run-down but start-up-filled quarter between busy thoroughfares due to budget constraints, local advocates decided to act. They generated a plan for a wooden footbridge and set up a crowdfunding system to begin its piece-by-piece completion by selling planks. Donors got their name or message engraved on to the plank(s) they purchased. Rotterdam’s city government eventually pitched in to finish the project because it got chosen by citizens to receive city funding and support. The obvious link between my project example from Tampere and the one from Times Square means that Tactical Urbanism is a very relevant concept for Finland, too. Finnish cities have admittedly been doing plenty of experiments within the urban planning realm throughout the country, but I’ve haven’t seen any transformation success stories. A lot of interesting stuff is however happening on the citizens-led front. Although, so far not so much around urban planning. But the cultural sector has certainly benefited from a recent influx of citizen-instigated initiatives. The often-cited Restaurant Day is probably the most known of them and it nicely displays characteristics of Tactical Urbanism. 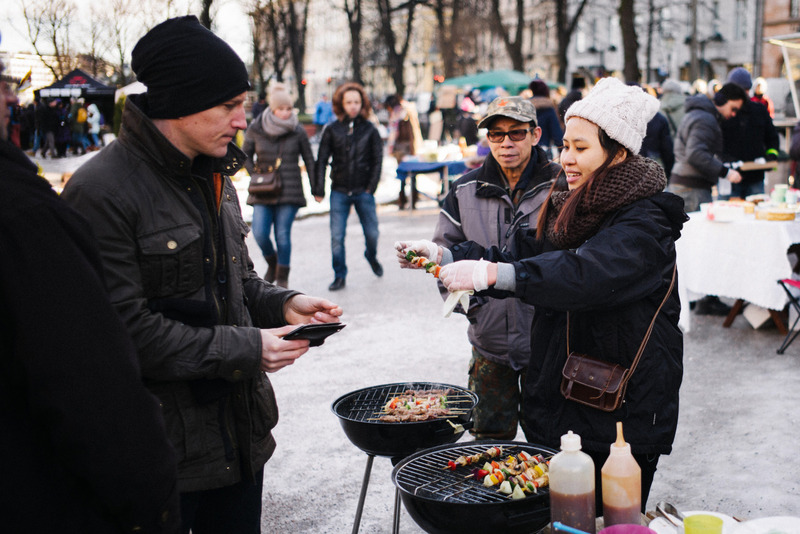 Restaurant Day seeks to transform Helsinki’s food and restaurant policies as well as to make the city more sociable. Photo credit: Roy Bäckström. The engine powering Restaurant Day came from a frustration to the inflexible policies around restaurants, and especially mobile restaurants. So in 2011, a handful of people just decided to open their own pop-up restaurant for a day without asking for permission from the city and invited others to do the same. The first Restaurant Day was carried out with 45 restaurants. Almost exactly one year ago, the number of participating pop-up restaurants peaked at 2724 in 35 countries. And what’s interesting is that the inauguration of Restaurant Day pushed Helsinki to ease their policies around food trucks (that are now present at every event) as well as it has led to a number of jumps from just-for-fun pop-up restaurants to real restaurants. Restaurant Day has not only made the city more fun and sociable, but it has also been a powerful tool for putting Helsinki’s and Finland’s policies around restaurants and food in the spotlight. So far, to my knowledge, there aren’t any Finnish citizens-led ‘tactical’ projects that relate directly to urban planning and that would have taken on-the-ground forms (I believe Park(ing) Day was tried once). But things may be changing quickly. The explosion in online discussion forums shows that people are clustering around the subject. All of Finland’s three biggest cities Helsinki, Tampere and Turku have thriving online communities on Facebook to discuss, exchange and advance ideas in urban planning. Especially in Helsinki and Tampere there are big groups that also have a clearly defined goal of supporting denser and more urban city building. Following these developments, also a couple of more or less substantial tactical initiatives have emerged. They are not the same kind of hands-on stuff many projects that get defined as Tactical Urbanism are (at least not yet), but they’re nevertheless still direct attempts to shake the system from within by using the same tools planners are. The first one of them is a project I’m involved in: a group of concerned urban planning activists called Urban Helsinki. Our idea has been to intervene in planning processes by drafting alternative plans to raise awareness about the needs of today’s urban living, challenge old planning ideas, and to call for more open public participation processes as well as clearer and more approachable ways of communicating plans. Our (Urban Helsinki) Pro Helsinki 2.0 plan shows how the city should be planned to make it more livable for 21st-century urban life. Image by Urban Helsinki. Our Pro Helsinki 2.0 project has also other tactical aims. Firstly, it seeks to address a major issue in comprehensive planning: it is a very difficult topic to discuss about. Typically, things work so that the city drafts a plan which offers a suggestion for the future, and throws it out for public review. But the problem is that it can be difficult even for professionals to fruitfully comment on a draft plan when there is just one way of developing to discuss. So as Helsinki started to draft its new comprehensive city plan, we decided to offer an alternative, more urban, vision to compare against. 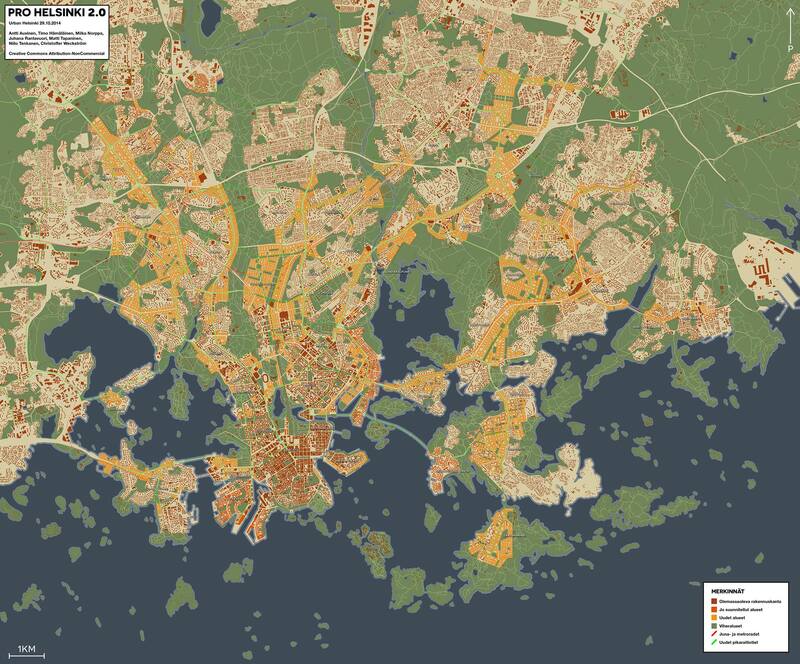 Secondly, the plan is an attempt to help some of Helsinki’s planning ambitions move forward. With Pro Helsinki 2.0, we want to help the city gather support behind the good parts of their plan so that they don’t get watered down or ripped apart in political fights by city-building conservatives. 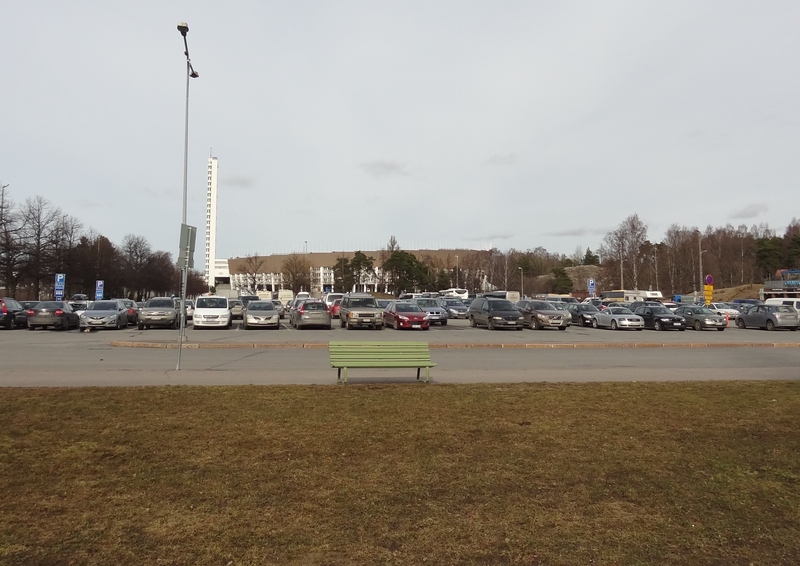 Before Urbaani Tampere got founded, people from the local urban activist community already organized a movement to support a plan for upgrading Tampere’s football stadium. The project also has intensification aims and the stadium regeneration comes with apartments and offices attached to it. This has sparked a NIMBY reaction in the neighborhood. 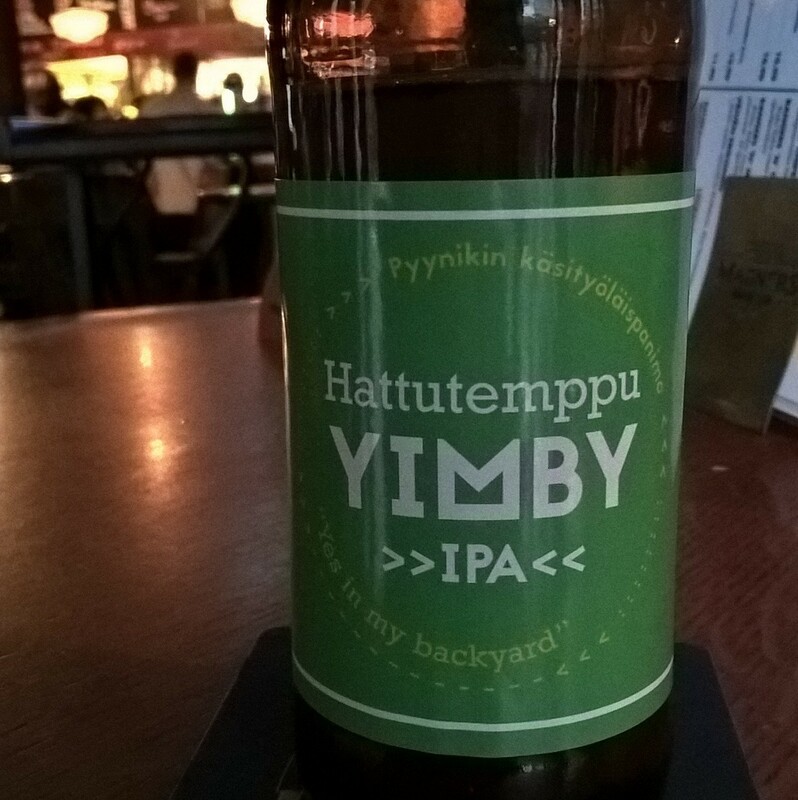 Last month, also a local brewery was mobilized to support the YIMBY movement. Photo credit: Prohattutemppu.net. A newer citizens-driven tactical initiative comes from Tampere. Or more precisely, it’s hopefully the groundwork for many projects to come. In March this year, a group of activists from the local urbanist Facebook group decided to form their own association called Urbaani Tampere (yes, the word ‘urban’ is threatened with inflation) to have a more structured approach for spreading and defending urbanist ideas in the city. A key driver in Urbaani Tampere’s emergence was and is to help the city “win” discourses around its new densification plans in the city center. So far they’ve drafted and submitted position papers to some key projects and they’ve also entered the public urban planning discourse to highlight that there are also YIMBY feelings in the city. I’m very much looking forward to seeing if the emergence of Urbaani Tampere leads to the hands-on sorts of Tactical Urbanism initiatives. Please invite me to take part if you do! This takes us back to Tampere’s Hämeenkatu experiment. The project thankfully got saved by the Mayor, but an important question to ask is would things have gotten to that point at all if there was deeper outreach to the city center’s business owners? And equally importantly, could the planners have taken YIMBY parties who speak the language of quality urbanism, like Urbaani Tampere, to work with them? In the context of trying to bring quality urbanism, these types of experiments haven’t really worked because there always seems to be shortcomings in coalition-building and/or programming. Last year we saw a policy-makers driven idea to pedestrianize a part of Helsinki’s Mannerheimintie get shot down using the exact same arguments that almost sank Tampere’s project. Another good example is Helsinki’s experiment from a couple of years ago to make Vaasankatu a pedestrian street. For one summer, the city removed cars from the street to see what would happen if it were pedestrianized. The result? Nothing happened. And I don’t really see what could have happened when you just remove cars from an ordinary side street. Had the city programmed the venture together with the local bars and restaurants and/or tested some cool street furniture, things could have been a lot different. Based on my experience of getting ‘tactical’, recent talks with experts, and following today’s debates around many Finnish planning projects, I’m also quite confident that these suggestions for cities to keep their antennae up for existing or emerging citizens-led projects is a pathway towards better participation, collaboration and coalition-building between the formal and informal. Developers can also use Tactical Urbanism. This is a visualization of a temporary shopping center that will soon get built in Helsinki’s work-in-progress neighborhood Kalasatama. It will serve as a “placeholder” until SRV will complete its mega-mall complex that will serve as the center of the neighborhood. 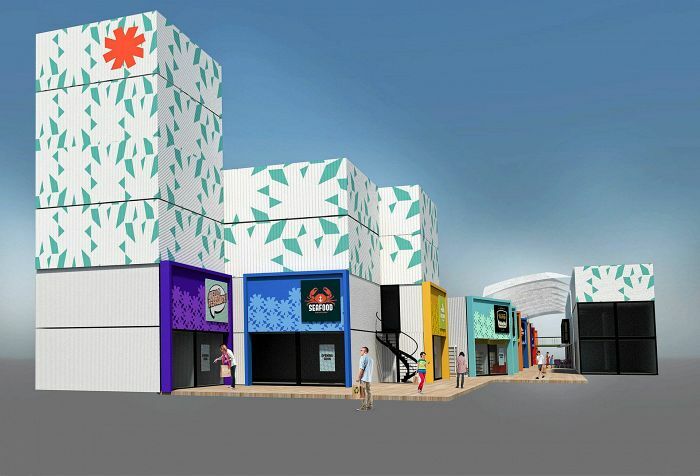 Sadly, in this case the container city already looks like better urbanism than the awful mall. Image courtesy of Hansacontainers Oy. Following the hype around the modern DIY culture, I think it’s also crucial for cities not to believe that they can plan ahead and provoke citizen activism. Because that’s impossible. But cities can and should definitely encourage their citizens to push for change and then welcome it with open arms when and if that happens. Lastly, Lydon and Garcia stress that Tactical Urbanism isn’t “the or even one solution for many of our most vexing urban problems” and that there is no ideal way for planners nor citizens to use the methodology. The scalability of ideas is a priority, but the bottom line is that Tactical Urbanism is an always unique method for people and authorities to join forces in thinking outside the box, discovering, testing and adapting new concepts, and, ultimately, making better cities. Cities, start cultivating a culture of experimentation today! K+S Urbanism – Will Mega-Retailers Kesko and S Group Ever Think Outside the Box? Another exciting year has passed! To wrap up 2014, I decided to piece together what I think are the six most important developments that shaped Finnish cities during the past year. Most things obviously weren’t invented this year nor did they directly affect every city; it’s better to grasp my list as themes that peaked to dominate urban policy discussions or to guide planning practice. Nonetheless, I feel that exceptionally much has happened on the Finnish urban development front and I believe the items on my list are likely to profoundly shape our cities and activities in them in the years ahead. Some of them I’ve already blogged about, some I’m looking back on now. Changing Work Patterns and the Rise of Urban Innovation Districts – The Future in Finland? The changing nature of how and where we work seems to be hollowing out Finland’s science & business parks and industrial areas. Is the geography of innovation shifting and leaving cities facing a choice between sticking with a landscape of vacant business premises and nurturing lively innovation districts? Today I have the great pleasure of introducing you to the alternative city plan for Helsinki that I have worked on with my fantastic colleagues from Urban Helsinki since early 2014. It’s our second land-use plan done completely in do-it-yourself fashion, and after the small project at the edge of Helsinki’s inner city we did some months earlier. I’ve written two posts about this project in Pikku Huopalahti, you’ll find them here and here. This article has been written in collaboration with Panu Lehtovuori and was originally published in Project Baltia's issue 22 "Infrastructure". Project Baltia is a professional journal covering architecture, urban planning, and design in North-West Russia, Finland, and the Baltic states. The journal is published in St. Petersburg. Panu Lehtovuori is an architect and urbanist. Currently he works as the Professor of Planning Theory at Tampere University of Technology’s School of Architecture. Not all images were published in Project Baltia.